Mazda has a challenge: grabbing share of voice and establishing a unique position in a very crowded arena. To make matters more difficult, the midsize car segment is now packed with a passel of fresh, highly competitive products like the Nissan Altima, Camry, redesigned Accord, VW Passat, and new Ford Fusion among them. 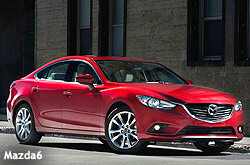 The automaker will enter the fray with the 2014 Mazda6 early next year -- and is, in fact, unveiling the car at the Los Angeles Auto Show on Thursday at its 9:30 a.m. Pacific Time presser. The automaker will pull the wraps off of the updated 2014 CX-5 compact SUV and face-lifted 2013 CX-9 mid-size SUV. It will also announce a new vehicle from Mazda Motorsports, and talk about its plans for a diesel powertrain under the moniker SkyActiv-D. Russell Wager, VP of marketing at the Irvine, Calif.-based Mazda North America, tells Marketing Daily that the fuel-efficient technology, which launched six months ago, will be part of vehicle communications going forward. "It won't be the focus, but it's a strong part of where the brand is going, and we will talk about it with the upcoming 6 and 9 launches." The company is also going to do more national advertising to build much-needed share of voice, using the new vehicles to position the brand as an "alternative to premium." "The Mazda6 is not getting its fair share of the market," he says. "It's a huge opportunity, but we are realistic; our marketing has been focused on the Mazda3 compact and the CX-5 [whose launch coincided with the introduction of SkyActiv]. But we are looking to take the new car, with its technology and style, and compete with any of the other entries out there." Coinciding with the launch, which will be just around the corner, will include things like a big presence in New York’s Times Square and an ad plan that, well, Wager can't talk about yet. "Also, we do an 'inside out' strategy: before we even talk with consumers from a mass marketing perspective, we start with employees, dealers, then owners and hand-raisers, and enthusiasts." He says after that, partnerships will be the focus with an aim to get more of the vehicles on the ground with experiential programs. "The company, he says, is basing its go-to-market strategy to some extent on the results of a commissioned study that looked at a range of data to model where the media mix should. "And we think, from that data, that it should be geared more to national. We will more do in-depth digital, and broadcast as well." He adds that the "alternative to premium" position is an attempt to carve out a "white space" for Mazda without going head to head with the major players. "If you don't have that, that bigger share of voice -- if you are outspent and outshouted, you get lost, so we think offering a premium product experience but not at a premium price is the space in which we can move forth, especially with vehicles like the new CX-9, which is under $30,000 for the top of the line."